He had me at orange juice. The King of Drama, SBS’s recently completed Monday-Tuesday rom-com, gave us meta-drama gold in the form of the ambitiously stoic super-producer turned upstart Anthony Kim. With enough drama of his own to suffice for a twenty episode run, Anthony played out a role that gave us failure and success- all in conjunction with real character growth. Here is to you Anthony, and yes, I know mere alcohol cannot defeat you. In episode one we find Anthony as a successful star PD in a production company that is poised to grow, grow, grow. Through a set of unfortunate events (partially caused by the man himself) we find an amazing career in ruins- dreams of drama-god powers extinguished faster than I slam a cup of coffee- which is pretty freaking fast. 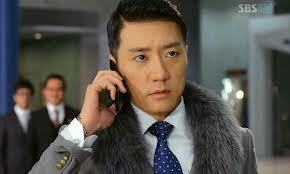 Prior to the complete collapse of our character’s career he is thrown together with a drama writing nobody- Le Go Eun. Their first meeting ends up badly due to Anthony’s cutthroat business practices and the conclusion of the situation finds Go Eun dumping water on Anthony and cursing him out. Faced with insurmountable odds, Anthony guides World Productions through casting, landing a director, and the ever complex side of the drama business. Along the way his emotionally stunted personality is challenged by our no-name writer Go Eun. As Kyungsung Morning experiences setbacks time and time again, Anthony works his ruthless persona in the name of the drama and ends up with far more heart than he started with. Anthony Kim is a man that is hard to like, at least from episode one. Upon introduction we are faced with an individual who puts his passion – dramas- ahead of everything else, often to his own detriment and the pain of those around him. Such a character, so focused and so nonsensical in his drive, is not easy to identify with. It is as the drama progresses that we can begin to appreciate the man who would sacrifice his own health for the drama. Anthony’s emotional awakening (or as I would like to think of it, the third most common disease in drama land- human emotions) is thematically solid and pushes forward the comedic gem King of Drama’s. From the hidden and painful childhood to the ex-girlfriend that compounds this character’s subconscious issues, Anthony gave us what he got, often responding in ways that showcased a deep seated growth that actually mirrored the production of his comeback drama. In a way Anthony Kim, The King of Drama’s, is the ultimate escapist drama fan. From an early age this character relied on dramas to ease the pain in his real life. As an adult Anthony is filled with a drive to create the best drama known to man. A fan, a professional, a man with a mission, the King of Dramas highlights what one man will do in the name of his passion. For this Anthony Kim is a great character, a great character indeed. Third most common disease, lol. Love that phrase–and oh, so true. I wish the ending had more of a bang, but the show was pretty solid. Yes, he was such a compelling character. I wasn’t planning on watching this live, but when I saw the first episode Anthony Kim is why I kept going. Same here. I was planning on marathoning the show once it had finished its run….I ended up watching it “live” thanks to the man himself.